BOOK EXCERPT: Creation of successful long-term strategies for protection or management requires explicit consideration of biological and ecological patterns at different scales. Species differ in their size, mobility, physiology, and life history, and each responds to the same physical setting in different ways and at different scales (Addicott et al. 1987; Kotliar and Wiens 1990). Thus, the planning scale appropriate for one species is rarely fully appropriate for others. Different species, communities, and ecological processes occur over different quantifiable spatial and temporal ranges. As a result, each can be observed over a set of characteristic scales. Additionally, ecosystem threats, and effective methods and actions for alleviating them, have characteristic scales at which they can and must be observed. Although specific threats to individual species, or small groups of species, can be recognized, ranking biodiversity elements or ecosystem threats to determine priorities for conservation is a challenging but necessary task. Significant gaps remain in our understanding of scaling, independent of data quality issues. Scaling discontinuity (Wu and Li, 2006) is one of these. An invasive species, for example, may be appear rare and patchily distributed at the local scale, yet continuous at the regional scale. Using only local-scale data, one would conclude that this species is of little conservation importance, but the regional data would suggest it to be a huge pending threat....Likewise, as the scale of a conservation plan changes, new questions can arise because of perceived change in relationships between targets and threats. As we discussed, an example of this is the sage grouse. At coarse scales, sage grouse are negatively affected by agricultural development due to habitat loss and fragmentation. At finer scales, however, agricultural fields play an important role as foraging habitat. Unfortunately, clear understanding of this kind about the multiscale relationships between conservation targets and threats is currently limited to only a few well-studied species. Addicott et al 1987. Ecological neighborhoods: scaling environmental patterns. Brock et al 2006. A wildlife conservation assessment of the Madison Valley, Montana. Temporal Renderer Template application: This application demonstrates how to perform time-based rendering of features in a feature layer to visualize real-time earthquake data. Sierra Foothills CNPS & Natureserve This webmap experiments with how to overlay 1:100k national ecological systems raster analysis from Naturserve, based on the National Vegetation Classification System, with local-scale field-based vector vegetation mapping by the California Native Plant Society and Calif. Dept of Fish and Game, also based on the National Vegetation Classification System. Clicking on the point symbols yields the Natureserve ecological system, Polygons=CNPS classes. 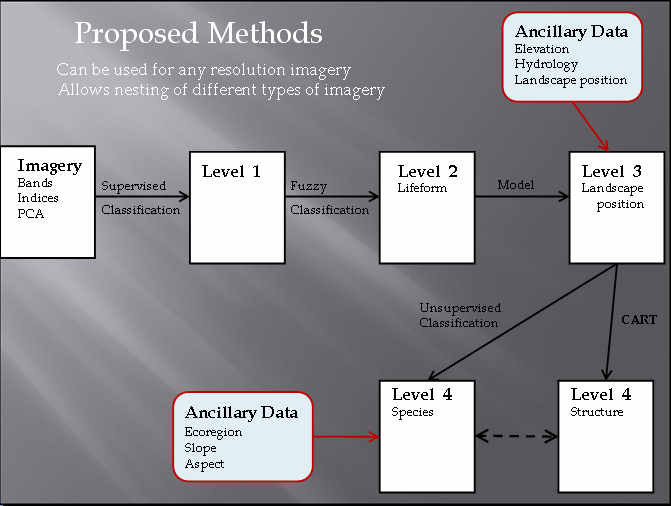 This map explores how to interact with and visualize related ecological data at 2 different scales, created by 2 different methods (analytical & field), in 2 different formats (raster & vector) but classified in the same classification system. Landsat Time-Enabled Imagery: (view larger) This map demonstrates the use of the standard time slider control to set both an extent of time and a position in time to explore time-enabled data at different temporal scales and analyze change over time using web browser access. Change Matters Website: allows users throughout the globe to quickly view the GLS Landsat imagery both multi-spectrally (in different Landsat band combinations) and multi-temporally (across epochs), and to conduct simple change detection analysis.